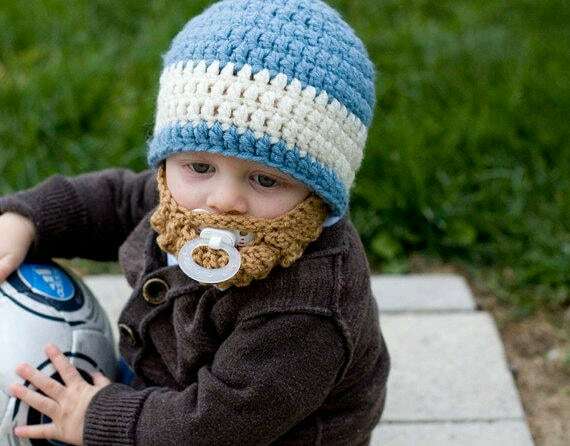 You've found the PERFECT Bearded Beanie for the little ones in your life! PLEASE check the MEASUREMENTS before ordering an Infant Item!! If ordering for a 12+m old, I would order a kids beanie instead. MIX-- Main beanie color followed by one thin stripe of a different color, one thicker stripe of a different color, and ending with the main beanie color. 2-STRIPE-- Main beanie color followed by one thin stripe of a different color, thin stripe of main beanie color, and finished with a stripe the same as the 1st stripe color. 1 THICK STRIPE--Main beanie color, 1 thick stripe of a different color, ending with the main beanie color at the end. Please select colors from the color charts to customize the BEANIE and BEARD. Leave us the specific colors for beanie, stripes and beards in the PURCHASE NOTES! !